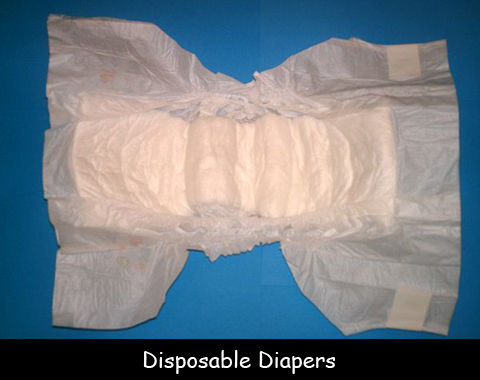 Have you ever wondered what people used for diapers before “disposable” diapers? The Chuckchi people, who lived in eastern Russia, carried their babies in fur bags filled with moss. When the moss got wet, they changed it. In northern China, babies were placed in bags filled with sand. The sand kept the baby safe and absorbed urine. In Europe and colonial America, babies wore cloth diapers. Since laundering was such a time-consuming chore, the diapers were rarely washed. Babies might sit in a wet diaper for several days. Yikes! Things improved in the early 20th century with the development of plastic pants. Early washing machines made keeping the diapers clean easier. But the disposable diaper really changed the game. Diapering is something modern parents barely think about. Vic Mills, director of development at Proctor & Gamble, was watching his newborn grandchild and became exasperated at how difficult diapering the baby was. He asked his team to develop a paper diaper. In 1956, the first disposable diapers were introduced in Dallas, Texas. They were hot, expensive, and cumbersome to use. They didn’t sell well. The company kept working on its invention and tried again in 1959. This time, sales were more promising. The company continued to streamline its production process, which allowed them to lower the cost of the diapers. Slowly, the first disposable diapers’ (Pampers) popularity grew. In 1956, only 1 percent of American parents used disposable diapers. Today, over 90 percent use them. Disposable diapers have made parenting a baby much easier, but they’re not great for the environment. Over 18 billion diapers are thrown in landfills each year. The diapers take years and years to break down. Disposable diapers contain chemicals that have caused allergic reactions in mice. Question: Can parents still use cloth diapers? Answer: Cloth diapers are still available and they’ve come a long way. They’re more absorbent and they’re available with easy Velcro outer shells (no more safety pins). Diaper services deliver clean cloth diapers and take away the soiled ones to wash them.